Grover Cleveland avoided the draft, hung two men, fathered a child out-of-wedlock, admitted all, and was elected, twice, to the presidency of the United States. Yet this most honest of presidents perpetrated one of the greatest deceptions in presidential history - and his secret, incredibly, held for a quarter of a century. What Cleveland hid from the American people was cancer, and the two operations he underwent to remove it. 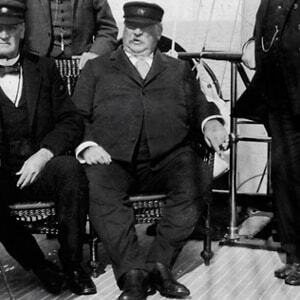 With his huge bulk, pasty complexion, and gouty foot, Cleveland was never the picture of health. Everyone knew he ate too much, drank too much, smoked too much – had a pretty wife, too, more than half his age – and only moved to sit somewhere else. What no one could even guess, though, was that in June 1893, Cleveland discovered he had oral cancer. The malignancy, he was told, necessitated the removal of the greater part of his left upper jawbone – immediately. And, had the country not been plunged in the first violent throes of the great financial Panic of 1893, Cleveland could have announced his condition, and openly undergone its cure. But he feared news of a life-threatening operation would only exacerbate the crisis, and so decided to keep his cancer absolutely secret. Cleveland died fourteen years later of heart failure. His cancer never returned, and no one involved in its removal spoke a word of it until 1917. Autograph Letter Signed, as President, 4 pages, recto and verso, octavo, Executive Mansion, Washington, July 1, 1894. To Dr. Joseph D. Bryant. Oneida [text is crossed out] one year ago to day [sic] – both feeling very different from what we do to-day and I guess you the most anxious of the two. The intervening time between that day and this is full of incidents filled with evidence of your kindness and devotion. and examined me with the greatest satisfaction. He took me by the hand and congratulated me with the greatest kindness and enthusiasm. He never tires of speaking of the splendor [text is crossed out] and success of your job. He has really made me think that my very dear medical friend is a good deal of a chap. my dear fellow and in all your plans give the biggest chunk of time to Gray Gables. Cal sits by me and is going to dine with me in about two minutes. I wish you were here.